The Shared Lives service supports people aged 16 and over with social care needs to live a full and active life and to stay as independent as possible. The small team of self-employed Shared Lives carers currently support 36 people, but more carers are urgently needed. A recruitment drive later this month will focus on Buckie and Keith but there is a demand for placements right across Moray, particularly in Speyside. The council’s Shared Lives officer, Diane Mcleary, said that no formal qualifications were needed to apply to become a carer with Shared Lives. She said: “When we asked people who use the service what qualities in a Shared Lives carer were important to them they told us it was things like patience and understanding, enthusiasm and being able to motivate, a sense of humour and flexibility. The community care service works by matching a person identified by social workers as requiring support with a Shared Lives carer in their community. Carers offer individualised daytime care and support in a homely setting to no more than two people at a time or overnight and longer stay so the families of service users can take a break from their caring role. Current service users range in age from 17 all the way up to 91. They work with their carer on skills for independent living as well as opportunities for socialising and pursuing their interests such as arts and crafts, enjoying nature and reminiscing. Christine Coubrough, from Burghead, began working as a Shared Lives carer in January this year and describes it as the best job she has ever had. “It is rewarding in so many ways to the point of enhancing my own life. The best thing for me is the satisfaction I feel when I have supported someone to make the most of their life doing things that make them happy,” said Christine (pictured with Pat Gaffney, whom she visits weekly at her home in Hopeman). 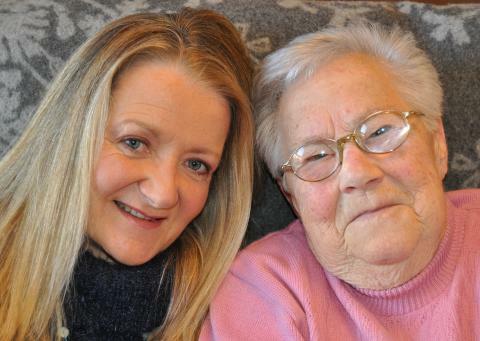 Eleanor Stewart has been providing a Shared Lives service from her home in Kinloss for a year. She previously managed a housing support team but missed having direct contact with people. There is a robust application process to be followed to appoint Shared Lives carers. The assessment, selection and approval process takes three to five months to complete. Training and support is ongoing and the carers themselves get together regularly.